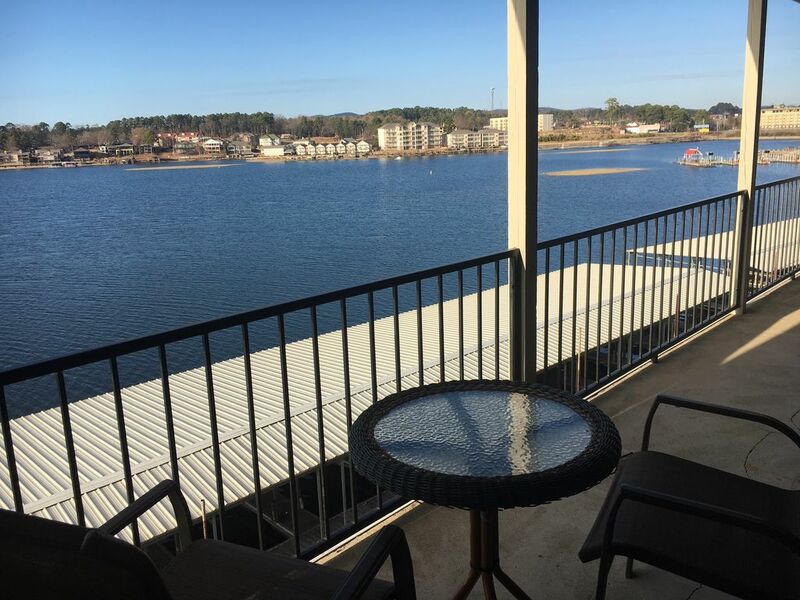 The Landing 8A is a top floor 2 bedroom, 2 bathroom condo is located right on Lake Hamilton. It includes a King bed in the master and a Queen bed in the guest room. It also features a full size roll-a-way bed and sleeper sofa. This unit also has a sleeper sofa in the living room. Not only is it beautifully decorated, but it also comes with a wonderful view overlooking the water. This unit has a flat screen TV/DVD/VCR in the living room and a TV in each bedroom. The living room has a fireplace and while the weather is nice, there's a seasonal swimming pool as well as an electric grill on the balcony. We loved the condo and the view of the lake.Very quiet complex and close to all shopping. Debbie, thank you for your review on this property. It is a lovely place! Hope to have you back! This condo has great views, everything you need to be comfortable, and close to town. The only thing I would say they need to improve on is the trash disposal...the dumpster outside the complex is really gross and unsightly. Great condo! We were extremely happy with the condo and the location. We will definitely be back. The condo was everything we expected. This is a well taken care condo that you can tell the owners take care of and keep updated. Great location and a perfect view! Very clean and close to many restaurants. Great condo enjoyed our stay.